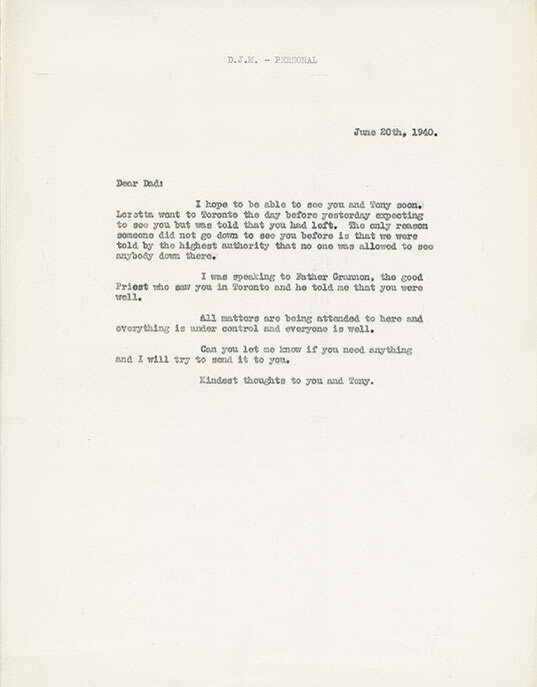 This is a one page typewritten letter from Daniel Mascioli to his father, Leopoldo (Leo) Mascioli - interned at Camp Petawawawa. It is dated June 20, 1940. Daniel tells his dad that the family went down to Toronto to see him but a guard informed them that they were not "allowed to see anybody down there." Daniel was referring to the holding grounds in Toronto where a lot of the internees were held before being sent to Camp Petawawa. There were three known holding grounds: Don Valley Jail, Landsdowne barracks, and Canadian National Exhibition (CNE) grounds. Leopoldo (Leo) Mascioli and his brother, Antonio (Tony) Mascioli were both interned during WWII.